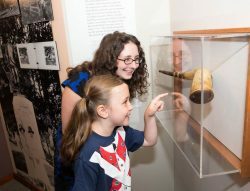 Tuesday, April 16 through Saturday, April 20 10:00 a.m. – 4:00 p.m.
From prehistoric mastodons to the Concord Town Cow, animals shape and reflect the history of the people of Concord. Be inspired by the furry, feathered, and fluffy creatures wild, tame, and magical that roam our town. Explore the history of Concord through animals in the Concord Museum’s Rasmussen Education Center this April Vacation Week! How was butter made in 18th century Concord? What animal did you need on your farm to make delicious fresh butter? Meet someone from Colonial Concord and try your hand at churning butter from heavy cream. What magical creatures did Henry David Thoreau and his young companion Louisa May Alcott find on their walks through the forests of Concord? Sit by the roaring colonial hearth and hear stories written by Louisa May Alcott of the magical creatures that you might find on your next nature walk. Listen carefully and look closely and you might find clues left by fairies! Stay for one story or for the full 30 minutes. All ages welcome. On-going Friday, with related art-making activity, Rasmussen Education Center Patio (weather dependent). Meet the Angor Rabbits whose fluffy fur transforms into cozy clothes. Work with a master weaver through the process of making fabric from carding to spinning to weaving on a loom. All ages welcome. When English colonists came to Concord for the first time, they met animals and people that they had never seen before. The colonists brought farm animals on their boats all the way from England, which were new and unusual to the native people who had lived in this area for thousands of years. The different ways these two cultures used very different animals sometimes led to trade and friendship but sometimes caused misunderstanding and conflict. Touch and hold Native American and English objects to find the similarities, differences, and opportunities for trade between the two cultures. All ages welcome.